When I originally conceived this post, I thought it was going to be relatively easy to research and write. 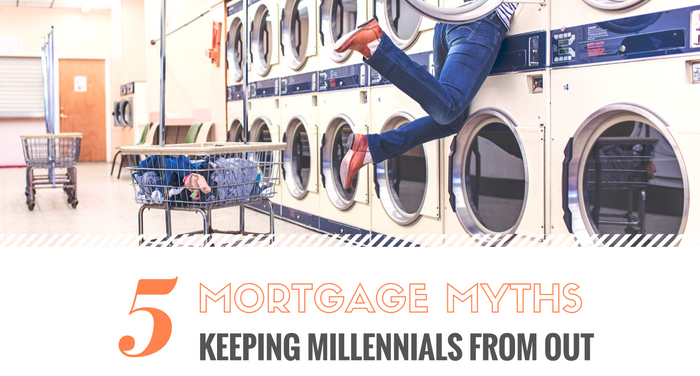 My expectation was that I was going to come up with 5-10 “myths” that you all could use in your marketing efforts, to help convince Millennials that the time to buy is now, and you’re the one from whom they should get their loan. Weirdly, that didn’t happen. Instead, what I found was that there are very few “myths”, and that the reality is that most Millennials aren’t buying either because they flat-out can’t afford it, or they can’t afford it within the context of their lifestyle (e.g., they might afford a house outside of Jersey City, but they want to live in Brooklyn). So, that’s busted. What now? Well, before I come up with a real suggestion for you, I do want to share the one actual myth that I found. It’s actually a little easy to see why this myth came into being. Even with historically, ridiculously low interest rates, houses are expensive. And given the opportunities for return on capital, a lot of land lords are offering rents that look extremely affordable. And, you know, people hate math. Thankfully, Trulia did the math for you. And for your prospective clients. There are a few oddball geographies. It’s actually cheaper for first-time buyers to rent if they happen to be in Honolulu or San Jose, CA. But, by and large, buying is the better financial choice (including in terms of cash flow). In fact, in the other 98 markets surveyed, the option to own vs. rent was, on average, 23% cheaper for Millennials. So, if that’s the only myth I could find, what is actually going on with Millennials? Well, the truth is, houses are much more expensive (relatively) than they used to be, and there’s a ton of debt (mostly student debt) that young people typically wouldn’t have had in the past, and the net result is — kids are poor. So, what are you to do as a mortgage broker? Well, remember in my last post when I said traditional marketing works, but being authentic is critical? Here’s where the rubber meets the road. If you want to resonate with the younger generation, you need to be the one to stand up, acknowledge their challenges, and help them out. The reality is, while many Millennials are living paycheck-to-paycheck, and while there are some legitimate reasons for this, there’re also a number of perceptional problems. “Living paycheck to paycheck” is nonsense if you’re buying your groceries at Whole Paycheck. The best way to market to Millennials, is to provide them some genuine financial guidance, for free, that helps them get into the position they want to be (BTW, 90% of Millennialswant to buy a home … they just don’t think they can afford it anytime soon). Start by providing advice on budgeting. Then, give them real advice on achieving financial independence. This isn’t going to get you new deals from Millennials tomorrow. But, if you consistently provide genuinely useful guidance of this sort, then in a year or two, you’ll have a huge following in your local market. And from there, you really only need one or two deals to close. Once you get even one, the power of word-of-mouth will make you the king of millennial mortgages in your market.